France is set to pay Russia $1.2 billion to settle the lingering dispute over two amphibious warships in a deal that went sour over the ongoing conflict in the Ukraine, according to French and Russian media reports. 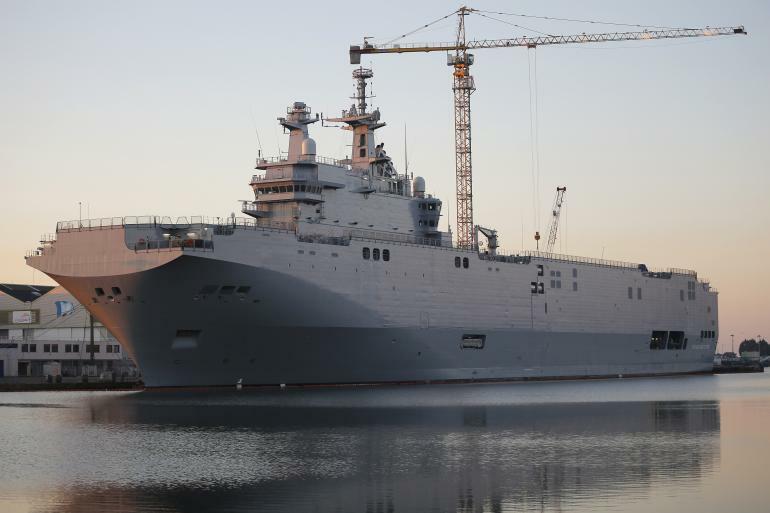 The deal — yet to be official — would have France keep the two 21,000 ton amphibs and retain the right to sell the ships to a country of their choosing, reported Le Journal du Dimanche. “Legally, this decision has not yet been formalized, but it is known that the Russian and French sides agreed within one month to determine the exact condition of cancellation of the contract for the supply of RF class ships Mistral, read a translation via the TASS Russian wire service. Russia has already paid $811 million as part of the $1.5 billion 2011 deal for the Mistrals — modified to operate in Arctic conditions and accommodate Russia’s heavier helicopters — and will reportedly not seek additional penalties or legal action. France will use proceeds from a planned $2 billion sale of Airbus EC 725 Caracal helicopters to Poland to fund the deal, reported the French paper. France and Russia have a month to negotiate particulars before the agreement is settled. The planned delivery schedule of the ships was halted following an announcement from French President François Hollande citing Russian involvement in the ongoing conflict in Ukraine as the reason. The move from France is unexpected. European military defense experts had expected France to eventually deliver the ships to Russia once the situation in Eastern Ukraine had stabilized. As for new buyers of the Mistrals, there are a few obvious candidates. NATO has expressed some interest in purchasing the ships to ferry its emerging rapid reaction force. The ships could also revive the Canadian Navy’s joint support ship concept that would create multi-purpose fleet oilers.